Target’s anti-union video for employees, has gotten a facelift. Read the exclusive story at The Salon. A federal judge on Monday set aside an unsuccessful unionization election at the Target store in Valley Stream, N.Y., and ordered a new vote, finding that Target managers had intimidated workers and violated federal labor laws. Read more at the New York Times. Read more at UFCW’s Blog. The National Labor Relations Board has ruled Target violated the numerous federal labor laws in an effort to keep their employees from joining the United Food and Commercial Workers Union Local 1500 last June. The ruling is a victory for all working men and women whose rights have been trampled on countless times by mega-retailers like Target & Walmart. These retailers act as they are too big and too powerful to be held accountable for their disregard of workers’ rights. Target is a company where the need for change is blatantly obvious. The ruling confirms Target had no regard for the law or the civil rights of their employees, poisoning the democratic election process in order to keep their employees at Valley Stream from joining our Union and gaining better working conditions. The brave workers from Valley Stream withstood flagrant attacks on their civil rights, captive audience meetings, anti-union video brainwashing, threats and scare tactics during last year’s union election. As one of the largest retail employers in the country, Target could – and should – lead the way in making sure that retail jobs are good jobs—not jobs where core American values and rights are trampled on in order to resist employees from joining together to demand better from their employer. Target’s actions last June were an injustice to workers’ rights throughout our country along with the one ideology our nation was built on, democracy. Workers have a right to band together and join a union, though retailers like Walmart and Target will do anything too keep them from achieving this through a fair process, including disregarding the very fabric our country was built upon, democracy. 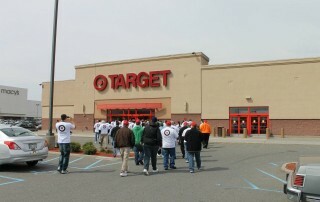 Media: Target plans to temporarily close the Valley Stream, L.I., store where it has been fighting a union drive. In response, United Food and Commercial Workers Local 1500, which has been organizing the workers for the past year, filed a request Friday for a federal injunction to prevent the closure. Read more at Crain’s New York. Target in Valley Stream will close April 28, 2012 at 10:00 PM purportedly to remodel the store for the sale and storage of fresh groceries. This Target location was the site of an important campaign last year by employees to seek union representation by our Union, UFCW Local 1500. Target Corp. has remodeled over 900 stores across the nation since 2009, bringing groceries to the newly remodeled stores. At face value, the procedure seems ordinary: close the store temporarily and then open back up with a brand new grocery section. But Valley Stream Target #1262 is far from ordinary. 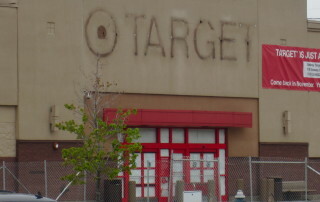 The store will become the first Target in the country to close for a remodel, a move that will replace and displace all of the store’s employees (only employees in “good standing with the company” were offered job placements or transfers) when the store plans to reopen in November 2012. Most remodels and renovations take two-three months at most to complete. 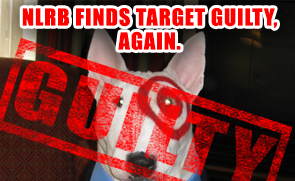 Why then, is Target closing the store for seven-months? In response to our Union’s accusations (and charges filed at the NLRB) claiming its closing is retaliatory, Target argues a store in Portland, Oregon will close for a similar remodeling. It’s true that store is closing, but for no more than two-months. Additionally, Target has not filed any WARN notice with the Oregon Department of Labor, meaning employees at the store will have the option to retain their jobs and will not be displaced/replaced. What makes Target in Valley Stream such a complicated remodel? It just so happens that following a February 2012 trial, charges of unfair labor practices against Target at Valley Stream are pending before an Administrative Law Judge of the National Labor Relations Board. The ALJ will determine whether the company violated federal labor laws and intimidated employees during a failed union election last June. We expect the ALJ to find that Target committed numerous unfair labor practices, which could result in an order for a second, fairer election this year. A result expected to be handed down during the convenient ‘renovation’ period. Of course, the current workforce will be dispersed and most employees, including union supporters, will not be returned to the store ever. Therefore, if the closing goes ahead, many current employees and union supporters will be ineligible to vote in a second election. Target is closing tomorrow, April 28, 2012 for ‘renovations’ and I wish they really intended on renovating their store, but as of April 20, 2012, the company has yet to secure a building permit from the Village of Valley Stream. As a result, it is unlikely that construction will begin any time soon and almost impossible for the store to reopen on November 11, 2012, as purportedly planned. To me, it seems the only renovations they’ve been planning, is renovating the courageous employees who came together last year to improve their jobs, families and lives by exercising their constitutionally protected rights.